Looking after your Dwarf Hamster will require at least the same care as the more common larger variety of hamster, however, due to their size they may need some extra special attention when it comes to their home. Dwarf Hamster care is not easy to get right, but proper care makes a world of difference to your dwarf hamster. Not only will your friend be happier and more active but most importantly they will live longer and be much healthier if cared for correctly. Because of the small size of your Dwarf hamster, it is often easier for them to escape and that also makes it difficult for them to be found! They are known to squeeze through the bars of the smallest of cages and therefore a secure housing unit is necessary. A suitable alternative to a cage would be an aquarium.Personally, I am not fond of aquariums simply because the glass can over time get a build up of harmful material on it and your Dwarf will end up becoming ill from this. However, because of their love of climbing, you will need to ensure that they have plenty of ways in which they can do this. Attaching a separate level and placing objects such as small branches is a way in which this can be achieved. Many pet stores have a variety of items that can be purchased for this purpose. 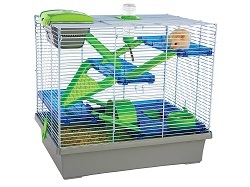 Also because of their active nature, it will also be necessary to include some exercise for them; a dwarf hamster wheel is perfect for this. 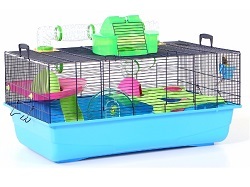 If you can also try to purchase a hamster ball which means that your dwarf hamster can roam freely while in a safe and contained environment. According to studies, it is not unheard of for dwarf hamster to run up to five miles in a wheel or ball. 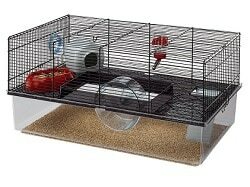 An important aspect of dwarf hamster care is making sure their bedding is clean and comfortable. Dwarfs love to burrow and hide away so consider a dust free and absorbent material. The most common is that of wood shavings. You could also include other materials like shredded paper and cotton which will allow them to nest. Nesting boxes are commonly found in pet stores and your dwarf hamster will surely love to hide in a nest box. Ideally, you should use a very mild solution of soap and water as harsh chemicals are not suitable and a hamster could become ill if they are used. After cleaning, ensure it is rinsed and dried thoroughly before adding the new bedding. 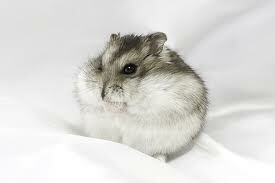 While they are smaller in size to their cousins, the dwarf hamster does have an extremely high metabolism and therefore will eat as much as the larger variety of hamster. Their diet typically consists of pellets and seeds with occasional fruit and vegetables. Hamster food will be found at most pet stores or grocery stores. You will notice that your hamster will hoard food and they have a habit of removing the food from the bowl and taking it to their nest where will eat it as and when required. A supply of fresh water is certainly vital in dwarf hamster care as their dry diet means that they can consume a lot of water. You will also want to include some toys in their homes, especially chewable ones. The teeth of a dwarf hamster never stop growing. Therefore they will always chew and gnaw and things. It would be wise to buy products specifically for this purpose as items that are not suitable could choke or injure the hamster. Specifically, those made of plastic materials. In actual fact, dwarf hamsters tend to have small needs compared to other household pets, and many owners will tell you they are a joy to own. While was not difficult to take care of they still have needs, and particular attention needs to be paid to dwarf hamster care if you want to get the most out of your pet.